Commonly referred to as "PPs", "Purple Pincher", "Blue Claw Crab", Caribbean Crab, "Pacific crab". The following is based on experience & info compiled from the web. Clypeatus tend to enjoy themselves the most when their environment has a temperature of 75-85 degrees Farenheit/23.8-29.4C (averaging around 80/28C or so during the day) and a humidity of 75-90% (averaging around 78-80% or so) with a drop in both temperature & humidity at night as there would be in the wild. Higher humidity during early morning & around dusk time with a drop in the evening seems to make them more active. A mixture of clean playsand and Eco Earth (Coco Fiber) in the 5:1 ratio is enjoyed by the c.clypeatus. To best mimic their natural habitat; use of natural leaf litter & worm castings is recommended. Shells that have a round, oblong or elliptical shaped opened are often favored by clypeatus. Many seem to prefer magpie shells but also like turbos. It's important to feed your land hermit crabs a wide variety of fresh and organic foods. A few favorites of the clypeatus include: coconut, seaweed, various types of fruit and fish. Each crab should be able to dip their shell opening into a pool of dechlorinated fresh water and salt water. It is important that ALL crabs have access to marine-grade salt water at all times. 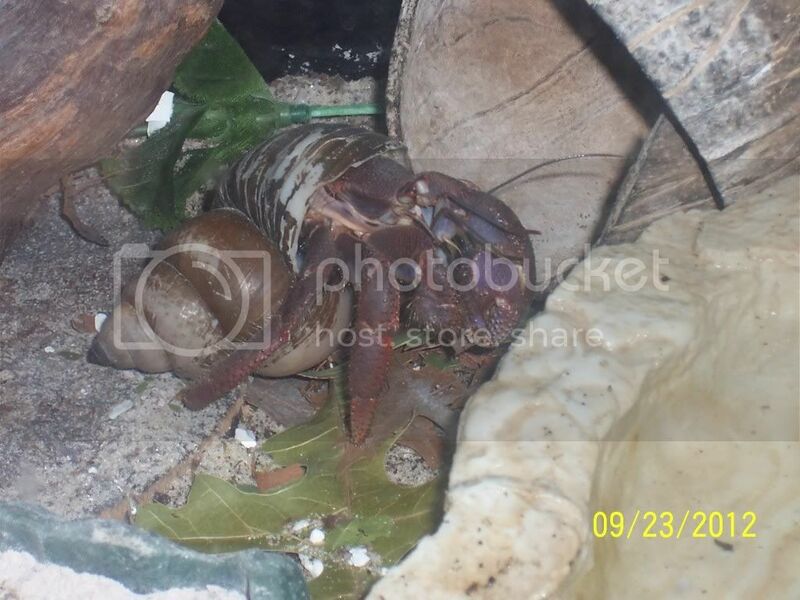 A lack of salt water in a hermit crab's environment can lead to molting difficulty. Coenobita clypeatus are considered the hardiest species; a very good species for beginning crabbers, but this does NOT mean they should be mishandled. A few of their favorite things to play in are: moss pits (they also enjoy to munch on the moss), cholla wood, driftwood and coconuts. Although in the wild crabs naturally segregate by species about 98% of the time, c. clypeatus have been kept with c. compressus (E's), c. perlatus (Strawberries), c. brevimanus (Indos), c. rugosus ("Ruggies") and c.bruneus (Brunnies) with fairly good results. THEY DON'T LIVE NEAR/WITH *ANY* OTHER SPECIES IN THE WILD. While some of these species get along with c. clypeatus just fine, they may not get along with each other-check each species' caresheet to be sure. You should never have just one of a species, get Crabby a species-buddy!